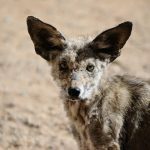 Seems the million dollar question when it comes to calling coyotes is “When is the Best time to Call Coyotes?” And the answer everyone has heard a million times over is “anytime you can”. Although that may be the case for most coyote hunting addicts, there are certain times that are better than others for these predator calls. I’m going to attempt to break it down so that a guy can better look at his own area and apply the parts of that breakdown to his individual needs. For most coyote hunter’s we tend to develop a certain degree of paranoia when it comes to these animals, and it’s not our fault, the coyote is skilled at putting us in distress. And the only cure is to send anyone of them off to the great beyond before your wife has you committed and medicated by doctors orders. They don’t realize that the paranoia subsides once you start connecting with coyotes, but then you gotta deal with the whisperings of obsessive compulsive disorders or some such yammering in the background. Pay no attention to it and just stay on course, they know nothing of what they speak. I think the biggest question is the when, like time of day. And the answer is complex in a sense because there are a few variables for the caller to consider. Generally I’ve found mornings to be the best time as all around time to call. The coyote population is still out hunting and very active in the morning. The prey species that coyotes depend on for calories like deer, pups and sheep, are also more active during this time of the day. The thermals are rising helping with scent control, etc. I can’t count the times when out checking my coyote trapline that I’ve seen coyotes out in fields hunting or just passing through. And many of those times I was able to kill them because they just can’t out run a .243 on a steady rest, many have tried and some succeeded but for the most part they just can’t. One would think a coyote you see in broad daylight just can’t be called while your truck is visible but I beg to differ, I have many times seen coyotes during the season out in a field doing what they do and just pull over grab the rifle and a call and get into the field and start throwing puppy whines and howl at them and bingo, ol’wiley turns around and starts trottin’ in, once he’s within range the shows over with one shot and he gets a ride to the fur shed. 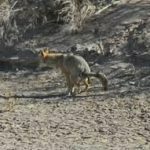 Another reason that early mornings are a great time to call is because the busy world around a coyote like the farmers and suburbanites has been quite most of the night, so things are pretty settled. I like to use the mouth call then because I think the coyotes are more relaxed at this time of day because they’ve been undisturbed and are in natural coyote mode. There’s no new sounds out there that may put them in distress or keep them pushed back. 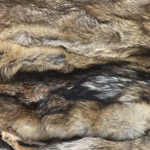 I’ve hunted close to more populated areas and can tell you that calling is tough, the coyotes tend to be skittish or skeptical of calls in minutes, and I think it has a lot to do with the high civilized population. As well as smaller or lesser areas to hunt and the areas you can hunt are more apt to be crawling with people from sunup till sun down. And I’ve found that either calling these areas at first light or at night are about the only viable option. Night time mouth call sounds can be difficult unless you have a full moon and a blanket of snow because here in WI., even though we can use a light for night hunting coyotes, it can only be used at the point of kill, no scanning the field your calling looking for eyes. Anyway back to the morning. So I would say the best time to call during hunting in the fall and early spring is mornings, it’s quiet and peaceful things are settled down after a night of rest and the coyote is stealthily sneaking around this time of day looking for a victim who’s screams will shatter the early morning silence signaling the beginning of a bright new day, well maybe not for the bunny but for everything else in the natural world. Also the coyote has his winter coat coming in and still has it in the early spring, which is quite warm and being that mornings these times of year are cooler than any part of the day, they’ll tend to be more active because of that as well in my opinion, this is also when you can hear howls. I’ve noticed even while trapping that those warm Indian Summer days of fall tend to be less productive for hunting predators, the coyotes just aren’t as active then, their coat is too warm for that weather and food is not that big of a concern then. Coyotes eat when they’re hungry, and when they’re hungry, they move. My second best time to sound the call to the predator in the fall or early spring is the early evening when the sounds of the mouth call or electronic coyote caller are clear. 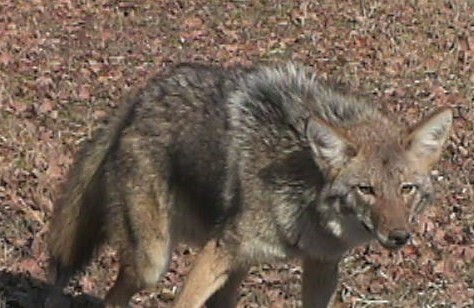 If your in a lesser people populated area coyotes tend to get active a little early. 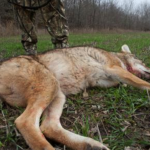 How many times if you’re a bow hunter have you heard coyotes start barking and yipping an hour or so before sundown. Up here in the north woods I hear it quite a bit. And too me that signals they are out and about. There’s less human activity going on to a degree, things are settling down and the coyotes are more at ease. Closer to the suburban areas, not so much. Not saying it can’t be done, but it’s less probable. One of the problems with this time of day though, especially say on your last stand before dark, you can run out of daylight before wiley shows up for supper as opposed to early morning where you have the daylight in your favor. Another thing I’d like to mention with these times of day for calling. You need to know the area your calling in and take into account what activities are taking place. It seems to be more of an issue with the early evening calling than the morning but can still affect the morning. Is there bow hunting going on, four wheeler activity, late afternoon bird hunters etc. 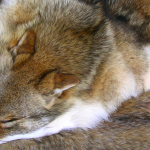 These can hinder a coyotes response, not that it’s an issue, we all have the right to pursue the activities we like. We just need to work around each other. With that said, choose your sets wisely so your not interrupted during your hunt, half way through your stand or at the crucial time of the shot and someone comes bumbling along and spooks what was suppose to be your next hat. 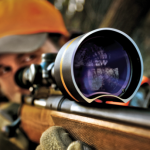 Fall season is a busy time of the year in the woods and evenings can be like rush hour with deer, coyotes, dogs and other wild animals or livestock compared to mornings but can be just as productive you just need a little more planning and insight of what’s going on in the area in terms of the predators. Now on to daytime calling during a hunt of the predator. I find daytime calling in the winter to quite be productive when I stand in more rural and backwoods country with less wind. As a coyote hunter, I love winter time calling, it may be more physical work with walking through snow and such but can be quite productive during mid day, giving relief to those mid winter blues. Temps in the winter can be quite cold and I have found that the colder it is, the better your chances at calling a coyote during the day. I’ve called coyotes in at 11am, noon, 1pm, 2pm, etc. and in just minutes, I was successful. During these brutal cold spells the temps are warmer during the day and with that it’s better not just for prey species to be out but for their assailants as well. Why? I believe it has to do with conserving vital energy and calories that are so important this time of year for survival. And this can for the caller can be advantageous. With that and the fact that a lot of outdoor activities have ended, about the only thing going on is cross country skiers, snowmobile’s etc. And I tend to stay away from those areas of activity. If you can’t get away from it, then your back to the morning calling scenario.. You can call all day in the winter in areas with minimal human activity, coyotes are out looking for the opportunity for a meal to get them through the much colder night so they can curl up and stay warm. 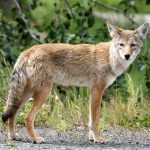 Another reason daytime calling seems to be better in winter, especially come January and February, is the breeding season is on and coyotes are very active throughout the day. This is good time for taking a ride looking for coyotes out and about and when spotting one immediately set up a game plan for where to set up and call the critter in, it can be that simple at times especially if using a decoy or trap, even if just yards away. In conclusion, I hope I’ve given you some insight as to what’s best to do in your area during the hunting season as a caller. Asses your situation as to what’s happening on a daily basis that would dictate the best time of day at what time of year that would make canis latrans more susceptible to your deceptive calling ways. By figuring this out for your individual area will put more coyotes in the back of the truck. What’s working for one guy in his area doesn’t mean it’ll work in yours and vise versa . There’s no cut and dried guarantee’s to a successful hunt, it’s all up to the coyote and what’s happening in is world. The more you know what’s going on in his world, the more successful you’ll be bringing him into yours. Good Luck hunting!